1982. A year that brings to mind the electronic sounds of Depeche Mode, the brilliantly colored, angular neon couture of emerging fashion, the first CDs, the birth of PCs, and the cinematic eye-popping 70’s inspired graphics of Disney’s cult classic, “Tron.” Starring Jeff Bridges as Kevin Flynn, the original “Tron” was the story of a young computer genius who circumnavigated the logic of fledgling computer technology to create the ultimate unique GUI (Graphical User Interface) by way of a “Honey I Shrunk the Kids” style De-rez, digitizing beam. Kevin finds himself kidnapped by the MCP (Master Control Program) inside the computer, and fights to survive as a “User” while teaming up with his friend, Alan’s, security “Program,” Tron, to escape MCP’s hold back to reality. As it happens, Kevin has been living in the world of Tron for the past 25 years, leaving his only son the head shareholder of Kevin and Alan’s game company, Encom. Sam finds himself blasted into The Grid –a digital world his father created–, and with the help of Quorra, battles life and death situations against a facist 1982 version of Bridges in order to free his father and return home. The Trailer for “Tron: Legacy” sent millions of fans drooling over the two-decade awaited sequel. Loyal Studios in Santa Monica, California, was the location used to shoot a portion of the trailer with Olivia Wilde. Using the studio’s spacious green screen, The Grid came alive with motion capture nodes, identity disks, ideal lighting, and, of course, the incredible flexible talent of Wilde, who gave Quorra a deep emotional resonance. Oliva Wilde in "Tron: Legacy"
Burbank California. William Ray Norwood Jr. –known to his fans as Ray J— and Bob Bekian have agreed to collaborate on multiple branded -content projects for distribution on the web. Ray J is an internationally known artist with multiple platinum albums as well as a star of 3 reality shows on VH1 . Bekian is a media entrepreneur who owns several state-of–the-art production facilities, a high definition production service company and the entertainment website REALHD.TV which is scheduled to launch in the fall of 2011. Bob, Ray J, and friends wearing limited edition Loyal Studios ‘fist’ t-shirts. A unique feature about the site is the design that does not “pre-roll” advertising on the video screen, nor does it obstruct the content with a lower third ad. Rather, the site feels as if you are watching a TV screen with clean advertising neatly organized in the player and control panel. “We felt that the pre-roll and lower third traditional web-ad strategies can be obstructive and a turn-off to viewers, so we have designed the site to be more viewer friendly.” Keeping the website clean and functional are very important to the feel of the site. 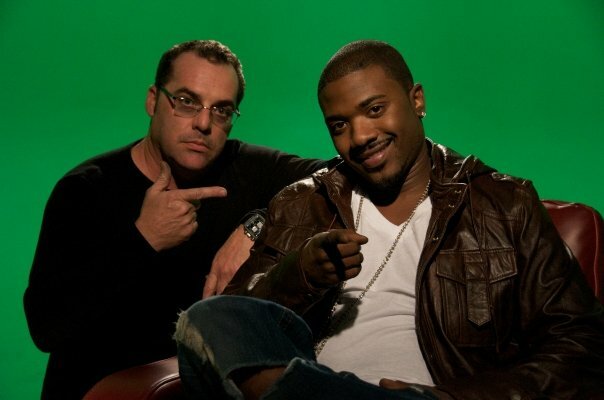 Ray J and Bekian started working together in Bekian’s Loyal Studios for “For The Love of Ray J” and “Family Business” produced by the Endemol Company 51MINDS. Their relationship grew as they collaborated on other projects together, such as music videos and behind the scenes content. “I’ve always admired Ray for his Talent, but he has a serious business side that I respect as well,” Bekian adds. Ray J and Bekian plan on doing multiple projects including a pilot and talk show hosted by Ray J. as well as cutting edge branded content. Christy Lee Hughs in Loyal Burbank Christy Lee Hughes Broadcasting from Loyal Studios in Burbank California. Another new and exciting show on REALHD.TV scheduled to air is “What’s Hot with Christy Lee” starring Christy Lee Hughes which follows the latest trends in entertainment, fashion, gaming and art. Christy Lee Hughes is a producer,actor and experienced entertainment correspondent who has conducted hundreds of hours of celebrity interviews in association with realtvfilms.com and loyalstudios.tv. “I am very excited to do this show on REALHD.TV because creative trends are always fresh and interesting and we have incredible talent lined up to talk to” says Lee who is currently wrapping several features.